Just few Days ago Google Announced Android v4.3 And Google Nexus 7 was the 1st Device to Run Android 4.3 out of the box and this update came after 9months after introducing android 4.2 and this will be the last update of Jelly Bean Version and the next update of Android will the New Version 5.0 (Key Lime Pie). Google has not brought a big change in Android 4.3 just some major update from Android 4.2 to android 4.3. And the new version begin to roll out to Nexus Devices like Nexus 7, Nexus 4, Nexus 10 and Galaxy Nexus. Google added multi-user profiles in Android 4.2 but through the new restricted profiles feature, users can restrict app usage and content consumption on an Android device. So you’ll be able to set profiles for each user of the device in case of multiple users. Android 4.3 will now support low-energy Bluetooth Smart accessories like heart rate monitors, pedometers, thermometers and many others. Android 4.3 now adds the autocomplete feature in the dial-pad suggesting contact names or phone numbers when users start keying-in something which however is already available in some OEMs like Samsung. 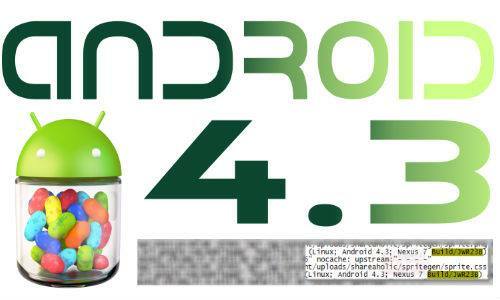 Android 4.3 now supports the new version of the industry standard for high performance graphics. Google also gave a demo of a game showing detailed textures, lens flare, and reflections. This was missing in Android 4.2. Google has now increased the location accuracy of Android devices by allowing location scanning via Wi-Fi. It now allows apps to get location data through Wi-Fi even when Wi-Fi is set to off and not being used for data access. Android 4.3 comes with an upgraded algorithm for tap-typing recognition that makes text input easier while chatting via messages or even while composing emails. It also brings a new emoji keyboard. The update also adds lower latency input for game-pad buttons and joysticks. Google has introduced native local language support to its operating system for Africaans, Amharic, Hindi, Swahili and Zulu. Hindi has finally reached the stock Android operating platform.Google has also added support for Hebrew and Arabic (right-to-left) in the home screen, Settings, Phone, People, and Keep apps. Android 4.3 also offers a new updated Camera app that features a new arch based menu which makes it easier to control settings and switch camera.